I read on this question What is in the space between neurons in a brain? that there is actually not much empty space in a brain. But my question is slightly different. Is there a visual demonstration I can see of approximately how "packed full of cells" the brain actually is? Obviously there wouldn't be a fixed answer as it is likely a continuum where the bigger you get the harder it is to swim through without being blocked by all the neurons/synapses. But what is a good ballpark size to be to swim through with relative ease? how "packed full of cells" the brain actually is? Yes. You can inject tracers in the CSF (Cerebrospinal fluid) or in the ventricles and monitor them. In this study, the authors have injected a fluorescent tracer in the CSF and used a direct imaging. We used in vivo two-photon imaging to compare CSF influx into the cortex of awake, anesthetized, and sleeping mice. The fluorescent tracers were infused into the subarachnoid CSF via a cannula implanted in the cisterna magna for real-time assessment of CSF tracer movement. You can also inject a radiolabeled tracer. The tracer should be a molecule that is not taken up by the cells. You can then visualize the space using Positron Emission Tomography (PET). But what is a good ballpark size to be to swim through with relative ease? You may find this interesting: the abovementioned study shows that the "space" expands during sleep and CSF percolates deeper into the brain. This allows clearing of toxic metabolites. Having said that, some interior regions would be difficult to reach. 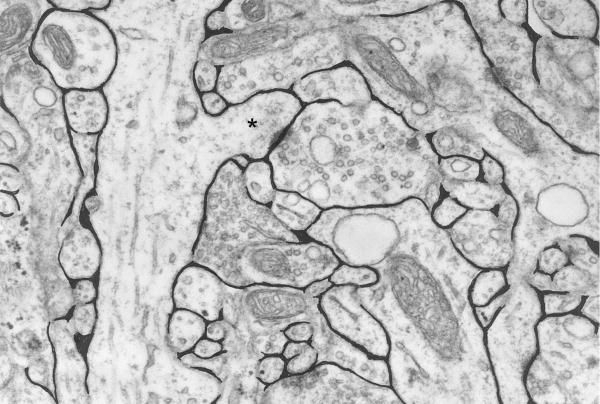 Apart from neurons, there are several glia which occupy the space. I am not entirely sure about this but in interior regions there would be very less of extracellular space (I am just guessing it would be less than ~1µm. See the black regions in the figure below). Extracellular space is 20% of total brain tissue but it is not constant throughout. For more details refer to this book. Not the answer you're looking for? Browse other questions tagged molecular-biology neuroscience microbiology brain human-anatomy or ask your own question. How does an axon “know” it's not connecting to its own neuron? Does our brain emit any kind of waves?